Tournaments that take place closer to the Ryder Cup will carry weighted points, helping in-form players to qualify. 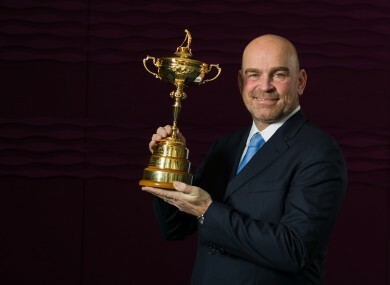 Thomas Bjorn with the Ryder Cup. EUROPE HAS MADE significant changes to its qualification process to allow more in-form players to make the side for the 2018 Ryder Cup at Le Golf National in Paris. Tournaments that take place closer to the Ryder Cup will carry weighted points, helping in-form European players to qualify for the team, it was decided following a meeting of the European Tour’s Tournament Committee on Tuesday night on the sidelines of the Abu Dhabi HSBC Championship. Other major changes include giving European captain Thomas Bjorn four wildcard picks for 2018 instead of three, as Europe ramps up its attempt to wrestle back the Ryder Cup from the United States. Players will also only be required to compete in a minimum of four European Tour events instead of five outside the major championships and World Golf Championships to be eligible for the team. But the committee voted to retain the current rule that a player has to be a member of the European Tour to be selected for the Ryder Cup. There was talk last year that this might be changed, especially with the in-form Paul Casey of England not making it to the team because he did not take up his European Tour membership. “I am delighted that the Tournament Committee passed these regulations which I believe will considerably benefit the European Ryder Cup team in 2018 without compromising the strength or importance of the European Tour,” said Bjorn. The 2018 Ryder Cup will be held 28-30 September next year. Email “Extra wildcard pick for Bjorn after Europe introduce changes to regain Ryder Cup”. Feedback on “Extra wildcard pick for Bjorn after Europe introduce changes to regain Ryder Cup”.